Comedian Nathan Fielder came up with a wonderful idea yesterday. 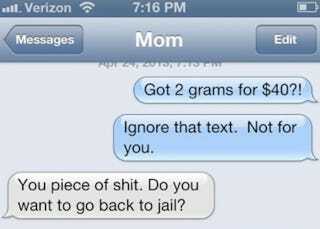 He instructed his Twitter followers to text "got 2 grams for $20" to their parents, immediately follow up with "Sorry ignore that txt. Not for you," and then tweet a screenshot of the ensuing conversation. The results were, as you might imagine, hilarious. Here's a few of the best panicked responses that people got from their parents. Be sure to head on over to Uproxx to see the rest. You heard Cameron's mom, rowers. Don't throw away your precious lung tissue on drugs.